Today’s water filter systems that implement RO promote various stages of water filtering and different types of filters, thus allowing the resulted solution to be up to 99% contaminants-free. This is actually one of the main features you should consider when purchasing a water filter system: the type of filters and the number of stages the water goes through in order to be cleaned. The Reverse Osmosis process, also called the RO, is a water purification method that manages to remove solids such as salts and other big particles using a semipermeable membrane. The tap water is pushed through this membrane with pressure and, during this process, the big particles are filtered away from the resulted water that is more pure. This method is used in both industrial and individual water filtration systems as it proved to be cost-effective and efficient in removing pathogens like bacteria and viruses besides the other type of contaminants already mentioned. Sometimes, a list of the best reverse osmosis water filter system reviews can definitely be of help, especially when you simply want to make sure your tap water is pure, clean, and safe to drink! In today’s world, the regular user can get a bit confused and overwhelmed by the abundance of information and products available and the best way to sort things out is by learning from other users’ experiences. This is why today we are going to discuss some of the best tap water filter systems that use reverse osmosis as their basic method. The ROES-50, Premium 5-Stage Reverse Osmosis features a revolutionary system that manages to remove almost 99% of the contaminants usually found in tap water (chlorine, arsenic, lead, bacteria and viruses and others). It is equipped with premium long-lasting filters and can also be used to treat well water. The 3 carbon filters and the .0001 micron membrane help in removing hormones and pharmaceutical drugs from the water, a feature that is not supported by many other systems. The ROES-50, Premium 5-Stage Reverse Osmosis isn’t noisy and is among one of the most popular systems on the market due to its Quick Connect fittings that allow for a quick and easy setup. The package comes with a lead-free faucet and the tubing is guaranteed to provide your family with pure water, removing the risk of deposits inside the pipes. The size is convenient as the entire system is made to fit a regular kitchen cabinet. This type of water filter system uses a method that purifies the water in 5 stages, thus managing to remove up to 99% of the contaminants. 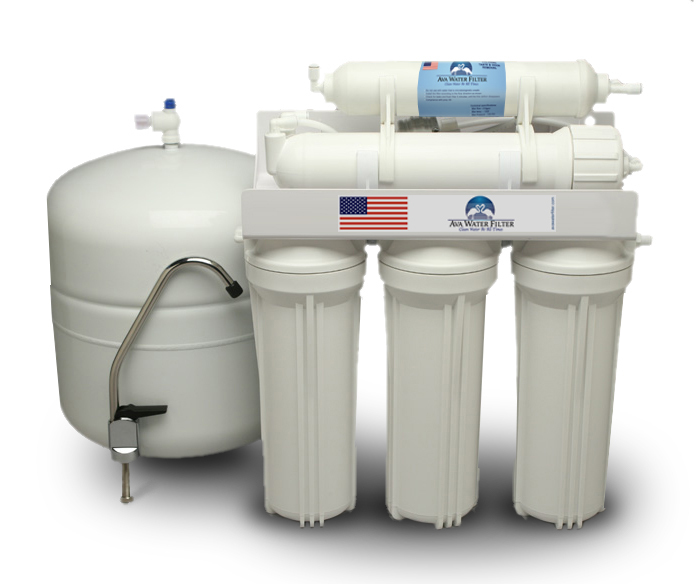 The Reverse Osmosis technology and the high quality filters make the 5 Stage Home Drinking Reverse Osmosis System PLUS Extra Full Set to be one of the most popular ones on the market. Users appreciate the system for the fact that it can be installed easily and the filters are easy to change. The package is delivered with an extra set of filters and the tech support is very friendly and attentive with the client’s needs. Also, you will find clear instructions in the package that will be of great help during installation and maintenance process. The 5 Stage Home Drinking Reverse Osmosis System PLUS Extra Full Set is created to be user friendly and this is one of the reasons so many users enjoy its services in their homes. The Home Master TMAFC Artesian Full Contact Reverse Osmosis Under Counter promotes an innovative design with long-lasting filters that are extremely simple to change, and a faster flow rate that allows the water to flow at higher pressure in comparison with other systems. The filters must be changed every 2000 gallons and you won’t have to use any sorts of tools in the process. This reverse osmosis water filtration system uses 7 stages to make sure the resulted water is pure and safe to drink by the entire family. Through these stages, the system manages to remove about 98% of the contaminants present in tap and well water and due to a special process where minerals (calcium and magnesium) are added, the resulted water tastes amazing. The Home Master TMAFC Artesian Full Contact Reverse Osmosis Under Counter is simple to install and maintain and it manages to eliminate problems encountered in traditional filtration systems. With an original, compact and light design that doesn’t require any installation, the Countertop Reverse Osmosis Water Filter – Portable & Installation, RO-CTOP can be hooked up to any faucet in a matter of minutes! This device is equipped with the 90 GPD portable system that comes with high quality and reliable filters to support the 4 steps of filtration it implements, allowing for about 97% of the solids to be removed from the water. The resulted water is fresh and pure, allowing you to feel refreshed regardless of your location. The Countertop Reverse Osmosis Water Filter – Portable & Installation, RO-CTOP system is extremely versatile and it can be used when you go on a trip with the family in the motor home, in your home or apartment, or you can take it with you during your travels as it only weights 7 pounds. It’s recommended for people who want a water filter system, but don’t want to make any pipe adjustments.